Learning how to cut a recipe in half isn’t hard. Have you ever found a recipe that you wanted to make but the servings were for a super large amount? A couple weeks back I found a great cookie recipe like these double chocolate pecan shortbread cookies, but it made 115 cookies. Of course I didn’t even think to split the recipe in half, instead I tried to make the whole batch in my 5-quart KitchenAid mixer. Let’s just say it was NOT the best way to make cookies. I needed to use 2 of my largest stainless steel bowls to make it work, and I had dough flying all over the kitchen. What a nightmare! I was so flustered at this point, with chocolate chips flying at my head and cookie dough all over the counter, that I started making mistakes. At one point I even used cornstarch instead of baking powder. Why in the world did I not just figure out how to cut a recipe in half and make a much smaller batch? I was only feeding a family of five, not fifty! Don’t do what I did. Cutting a recipe in half is easy, so you can make less if you need to. 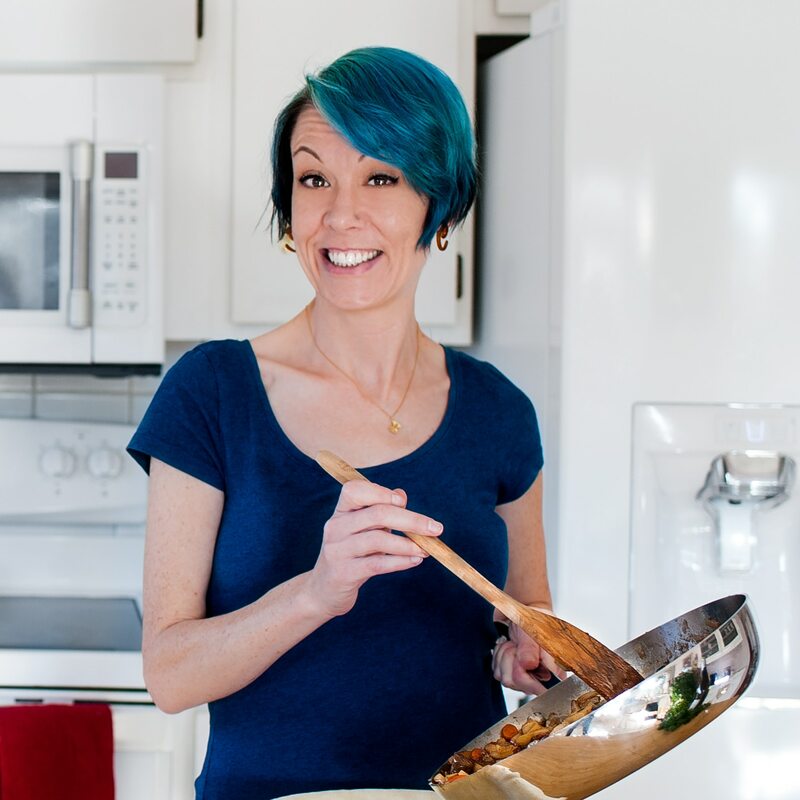 Let me show you everything you need to know to reduce your recipes without worry, math… or a face full of cookie dough. 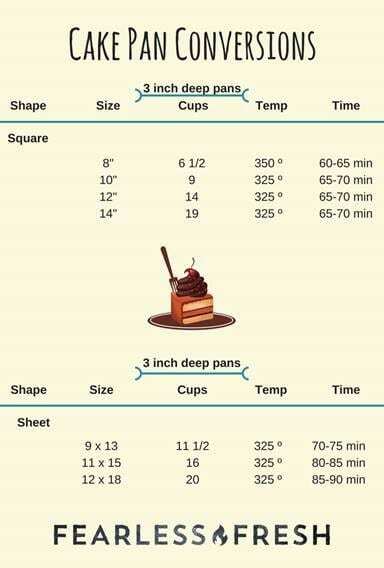 And in case you didn’t know, there’s a cooking cheat sheet dedicated to working with numbers in the kitchen! 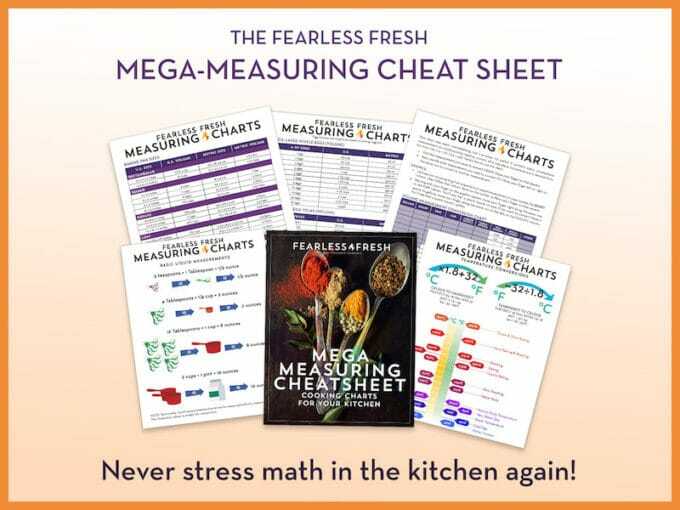 With the Mega-Measuring Cheat Sheet, you’ll never be stumped by cooking math again. Check out these reviews. 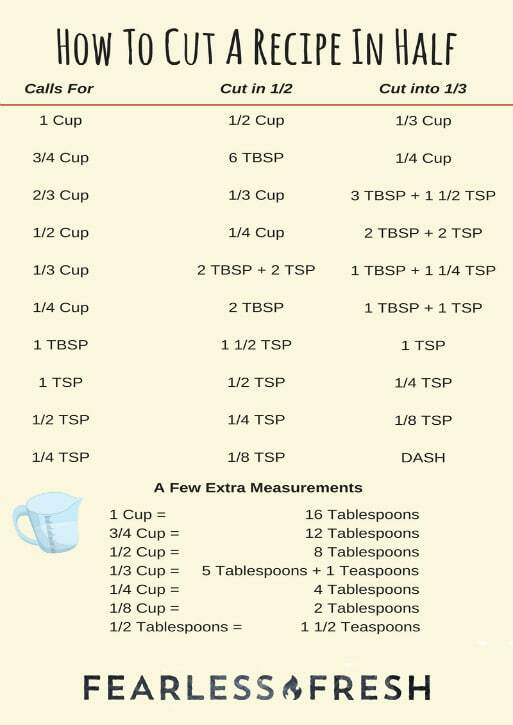 Use liquid and dry measuring cups for the appropriate ingredients. You will often need to change pan and bowl sizes as well. This goes for saucepans, skillets, mixing bowls, baking pans, etc. 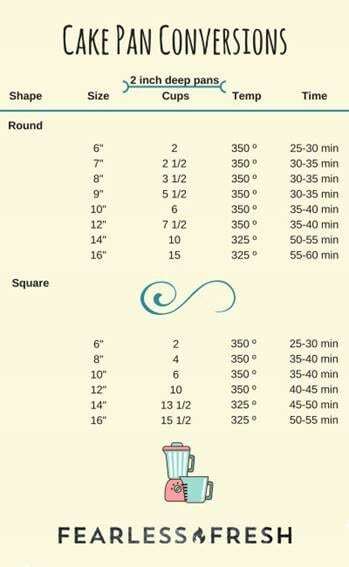 See below for more information on baking pan sizes. Cooking and baking time for smaller amounts of food may also be less, so until you get used to the smaller recipe, keep an eye on your food while it bakes or cooks. Not all recipes will easily cut in half. Casseroles and most savory dishes can be reduced, but items containing yeast, such as breads, don’t always work so well when reduced. These types of recipes may take a bit of trial and error to get them just right. 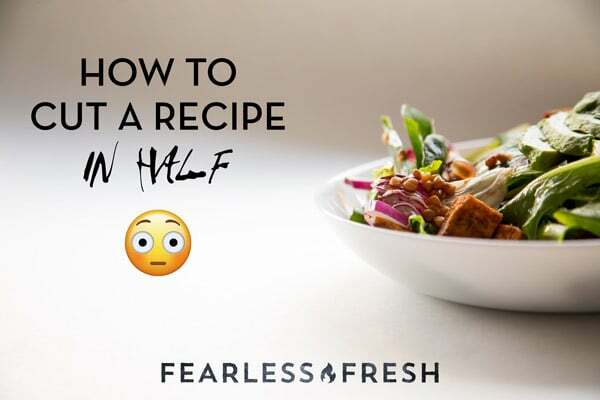 Cutting a recipe in half may also affect how you can mix it. Example: putting a very small amount of a recipe into a full-sized stand mixer won’t mix very well at all, because there’s not enough volume for the mixer to do its job. Sometimes it makes more sense to mix smaller recipes by hand. How to cut a recipe in half — charts! 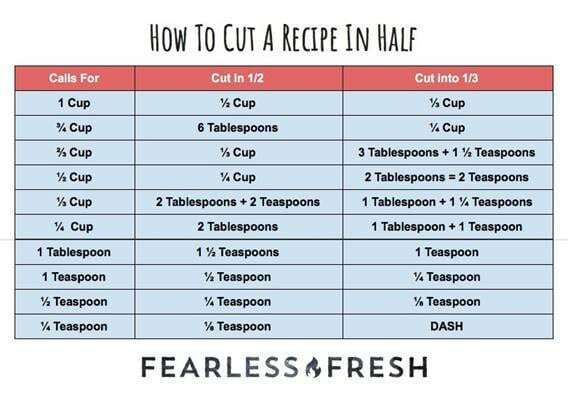 The handy chart below will help you cut each ingredient within a recipe in half. It helps to write out a new ingredient list with all of the new measurements and cook from that, because it’s really easy to accidentally make a mistake and use the original amount unless you have a written list to work through. Also, keep the below chart nearby when making your recipe. I have it printed out and stuck to the the side of my fridge so it’s always there when I need it. Super handy when cutting a recipe in half. Crack the eggs into a bowl and whisk until everything is combined. A stick blender will create a perfectly uniform egg mixture that’s easy to measure, and also break up any stringy egg whites that can cause problems. Then, pour the beaten eggs into a measuring cup. Now you can divide the eggs by volume. One large egg contains approx 3 tablespoons, but you will still want to measure for accuracy. Pan sizes can get a little tricky when it comes to learning how to cut a recipe in half. 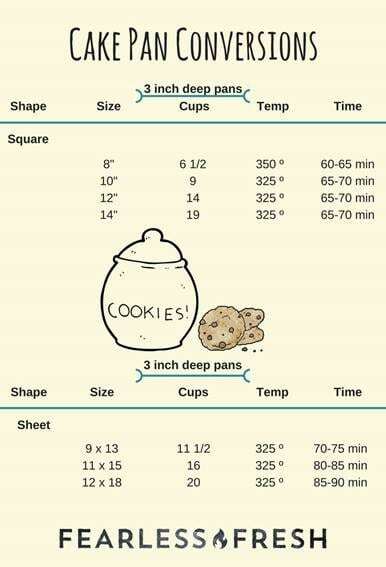 Here are some thing to keep in mind, and you’ll find some handy charts below that will help you figure out what size baking you’ll need. Check out the charts attached to this post, below! When using a different pan size, try to keep the depth of food the same so that you end up with the intended consistency and texture. If your food will have the same depth as the original pan, cooking time should be roughly the same. I start checking for doneness 5 minutes sooner, just to be safe. If your food will have a shallower depth as the original pan, the baking time will be less. If your food will have a deeper depth as the original pan, the baking time will be longer. Keeping an eye on your oven will help prevent your food from drying out and/or burning. For cakes, test periodically with a toothpick, and look for the edges pulling away from the sides of the pan. Reduce the oven temperature by 25°F when substituting a glass pan for a metal pan. 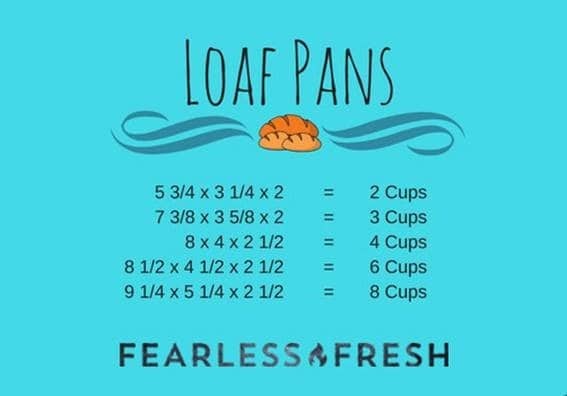 Note: the Fearless Fresh Mega Measuring Cheat Sheet includes a great chart for figuring out what size baking pan you’ll need when reducing recipes! They make learning how to cut a recipe in half super easy.